Sonata : for solo piano [eScore] / Aristea Mellos. Sonata : for solo piano / Aristea Mellos. Three recollections of a Roman Holiday. Contents note: I. We ate the stars-- II. Cardinal Spada's Gallery -- III. Vanishing Point. 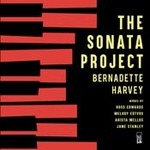 11 Nov 2017: at The Sonata Project: Bernadette Harvey (Verbrugghen Hall). Featuring Bernadette Harvey.